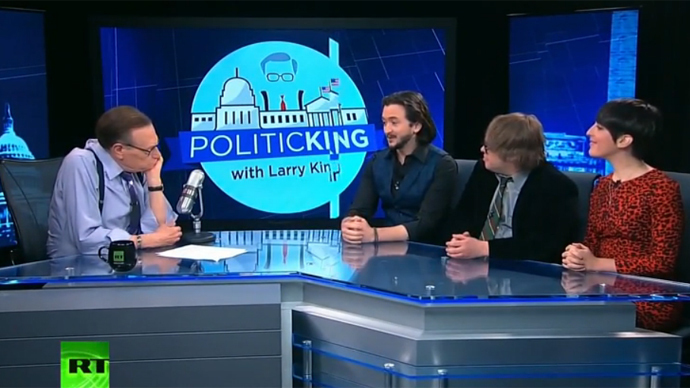 Bashing both Democrats and Republicans – who agree on 90 percent of key US issues – and giving a voice to independent journalists is the success recipe of RT America’s political comedy show Redacted Tonight, creator Lee Camp told Larry King’s Politicking. The team of the “radicalized satirical comedy show” told King that shooting in Washington, DC is a great advantage for the program, as they not only have direct access to policymakers, but also use the White House as a backdrop. Larry King: Joining me now is the cast of Redacted Tonight, it airs on RT America on Friday nights at 8 Eastern. They are Lee Camp – stand-up comedian and activist, who created Redacted Tonight; Abby Feldman, the actress and comedian and former member of the ‘Upright Citizens Brigade,’ and John F. O’Donnell – a writer, who has been featured in The Huffington Post, The New York Times and has also appeared on Comedy Central’s Fresh Faces of Comedy. How did all this come together, Lee? Lee Camp: We have all been doing comedy for a long time and I have been doing political stand-up comedy for 15 years and talking about issues that I really cared about on stage – trying to combine it with laughs to make these issues palatable for your average audience member. And then RT said ‘could you give us a comedy show,’ so I worked with RT on creating this show. King: Did you find Abby and John? Camp: I found John because he and I knew each other for about 10 years on the New York City stand-up comedy circuit and I knew he was amazing, so I brought him in and he was friends with Abby, so that’s where we found Abby. King: So you [O'Donnell] brought Abby. John F. O’Donnell: I was at a comedy club in New York after the show was just getting started here in DC and we were there, hanging out, and I was telling her about the show and she was so excited about it. I showed her some clips and she loved it so I told her we are looking for another correspondent for the show and she started submitting stuff, so we knew she was the perfect fit for the show. King: So you are a stand-up [O’Donnell] as well as you [Camp] right? And Abby, have you been a stand-up too? King: Or were you drawn to political comedy? Feldman: In a different way, yeah. I have political kind of general ideas, but not as specifically activist as these guys, but I have been learning a lot from them since I joined the team, but I have general political ideas. O’Donnell: I would say out of the three of us, Lee’s stand-up is the most overtly political. He has found a way to filter out all this important political information through the medium of stand-up. I have found that I like to do it, but it is a very difficult thing specifically in stand-up to not come across as being angry, self-righteous, preaching to the converted. But there are ways to do it and you just have to be very creative. And now that I am again so re-immersed in politics, as I have always cared about it, I am trying to put more of it into my stand-up and it has been a fun and interesting experience. Feldman: I came from more of an improv and journalism background and wanted to move away from the specifics and I think I bring more of an absurdist comedic angle to my set, so it balances out. King: These kinds of shows like Comedy Central…are they all tending to be towards the progressive left? King: So they are easier to attack? Camp: It's hitting down. It is uncomfortable to see a comedian hitting down on someone who is lower than him. King: So give me the format of the show. O’Donnell: So the show generally opens with Lee's opening rants, which gets everybody warmed-up. This is normally the first opening segment and then cut to title sequence. Then Lee normally has his opening the news segment, then it cuts to a desk segment, where myself or Abby are political correspondents on the show. We will do a satirical piece together. We switch off every week. King: All of this is written? O’Donnell: Yeah. What is kind of crazy about our show is that we write all of our content. There are currently no additional staff writers. Camp: There are also two people who are not here with us, Sam Sacks and Philip Chang, who also do great stuff on the show. King: So your piece ends and then what? O’Donnell: And then we do a lot of parody ads. We have the ability to attack advertising and big corporations and stuff like that on this network, so we try to take advantage of it as much as possible. Abby and I did one where we were parodying Dunkin Donuts, we did another one about the iPhone. Lee did another one about Coors Light and we have done one almost every week. King: And then does Abby come in after you? Fledman: Well, it depends on what we are doing. We alternate. We will do a desk segment, or we will do a field piece, or we will be doing a man on the street and talking to people about whatever the topic we are doing and we have a lot of fun with that. Camp: Another thing we have over other comedy shows is we are in [Washington] DC. We can go out in front of the White House and talk to people right there. John has been in the halls of Congress talking to people. O’Donnell: We did a really fun thing. After Congress recessed, after only coming back for something like eight days after their summer break and they had just passed appropriations allowing for some training and bombing in Syria. So I went into the halls of Congress and into the Senate building and the Russell building and I was like, ‘let’s ask people what’s going on.’ This is an important thing – the passing of this bill to arm the rebels, but there was nobody there, so I kind of just ran around the halls looking for people and it was kind of a fun and interesting thing to do and we have that ability because we are in Washington and we try to take advantage of it. Abby does a lot of MOS’s in front of the White House and it is pretty amazing. Fledman: I do a piece in front of the White House so I can go around and hug people or offer them renal filtered water. King: Is it all live? Camp: The show is live to tape, so we tape it in front of a live audience, which is small – around 25 people or so – and then we go from there. So yeah – its live to tape. King: So this must be a lot of fun to do and you continue doing stand-up during the week? Camp: Yeah, I think we all try, but this takes up a lot of our time and we work really hard on it, but I try and keep touring. I just got back from Philadelphia and Boston and the live crowd is part of all of our passions – so we love the show and we love the live crowd. O’Donnell: And luckily the scene in DC, the stand-up scene in DC is really up and coming and its pretty great. So when we have time, we can bounce around the city and do spots. King: Is this an easy city to make fun of? It’s duck soup right? King: Sitting on the ground? Feldman: Yeah, or whatever it might be. I might be encouraging people to drink my renal filtrated water, or encouraging people to become Amish in order to prevent war. Camp: One thing I will tell you about doing stand-up in this city is the audiences. Half the time there are people in the audiences who are congressional interns, so a lot of the things that John and I say on stage can make those audiences uncomfortable. O’Donnell: I would like to tell you one example. One thing I would do in the Dupont Circle area is say ‘round of applause if you think Edward Snowden is a hero.’ I would get a little trickle of applause. Then I would say ‘round of applause if you think he is a traitor’ – I would get a little trickle of applause. I would say ‘round of applause if you didn’t applaud because you are maneuvering for a political position and you don’t know how you feel about the situation, so you don’t want to respond.’ Everyone starts clapping and just going to town about it and I was like – this is very telling about what is going on in Washington. People don’t really want to define what they are about, but at Redacted, we can’t help but do so. King: Is this administration easy to make fun of? Fledman: Yeah, I think what comedians do is make fun of the status quo. King: Who is the general picking point at the moment? John Boehner? Barack Obama? Camp: My position and my feeling is that the two main parties – the two corporate parties agree on 90 percent of the biggest structural issues of our time, whether it is the NSA or our thousands of military bases around the world. So we do go after these people like Boehner and Obama. But it is more the two party funded system that gets the center of our ire because until you get money out of politics, you are going to have a very middle of the road, very pro-Wall Street, two party system. King: Do you think there is any difference between the two parties? O’Donnell: Yeah, I definitely think there are differences on domestic social issues and things like that and these things are important. Often these social issue things are used as hot buttons to keep people divided from each other rather than coming together and actually having some evolution in this country and I think that this is an unfortunate trick that a lot of politicians do. But as Lee said, ever since this Citizens United vs the FEC [Federal Election Commission] ruling, it really is the thing that all these issues are connected to money and politics. For example our unjust criminal system – this crazy prison industrial complex – that’s connected to money and politics. There is lobbying there and there are private prisons that are publicly traded, and that is a really tragic situation. NSA surveillance is a thing that most Americans are not for on both the right and the left. So I think it would be interesting if people from the right and the left could come together on single issues to try and enact change. King: We have always used humor though. America has always been funny. Feldman: I think that is the comical relief that you need. America has always been funny and I think our show would do well internationally just because people, when there are hard times and there are wars going on, when there is so much money in politics, when they are trying to make change but seeing all these barriers in front of them to try and make change – they at least want to hear that someone agrees with them and someone is making fun of it. King: You are on Fridays. Who sits down and decides the topics? Camp: I decide a lot of them, but Abby and John sit down and pitch ideas about what they would like to cover that week. They will often come to me with two or three things that they think are important that week. King: What happens if you have something break on a Friday? Like the Hilary Clinton story – when did that break? Feldman: With Lee’s rants, he can have a little bit more flexibility and stick something in last minute, but we try to pick topics that are not evergreen, something that is going on right now, but something that I film on Tuesday or Wednesday, I know it will still be relevant on Friday. Camp: And you know something that I remember breaking on the day we were taping was the Ferguson unrest – the day when it really started to get out of hand. King: And how did you make fun of that? Camp: We went after the police response, like that great video of the police taking down that journalists' cameras and bashing in the cameras. That sort of thing I think we should all be against. We can all argue about what happened in Ferguson, but I think we should be against cops breaking down journalists' cameras. So we went after that angle a bit. O’Donnell: I think this is something our show tries to do, which sets us apart. We give a lot of shout outs to the activist community and the independent journalists' community. For example, in Lee’s piece, he got citizen journalist information that this was happening in Ferguson and because he brought it up and referenced everybody and leant exposure to that scene, they were all very excited to get news coverage – albeit in a radicalized satirical comedy show. King: Well, you guys were a lot of fun and I think the shows going to be a guaranteed hit. I want to thank the show creator Lee Camp, Abby Feldman and John F. O’Donnell – who does not look like John F. O’Donnell. 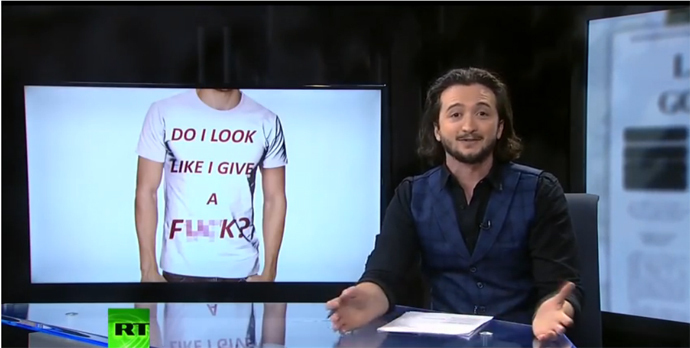 The show is Redacted Tonight and it airs Fridays at 8 Eastern on RT America. Thank you for joining me on this edition of Politicking.